an amusement park? Read the first sentence of each paragraph. Guess: What does the writer talk about Singapore? Reading: Have you ever been to Singapore? 3 Read the first sentence of each paragraph. Guess: What does the writer talk about Singapore? 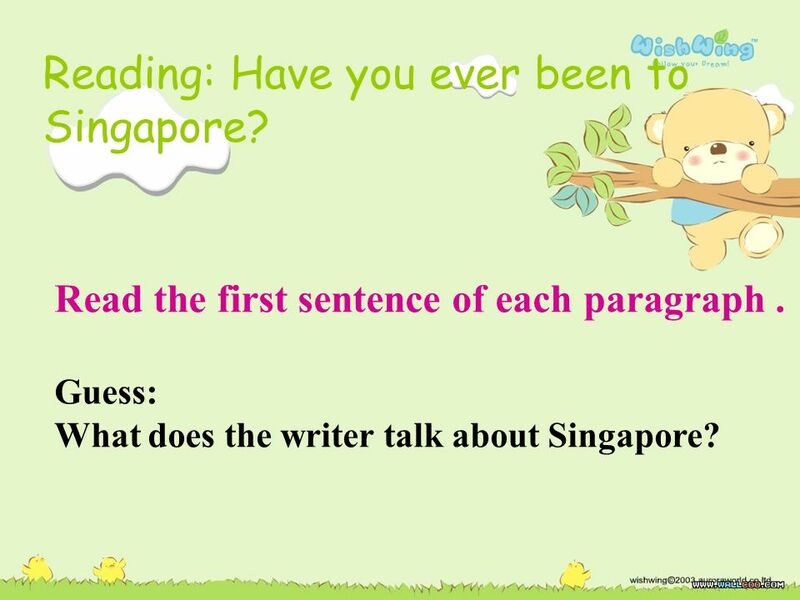 Reading: Have you ever been to Singapore? 6 Most large cities have zoos, but have you ever been to a zoo at night? 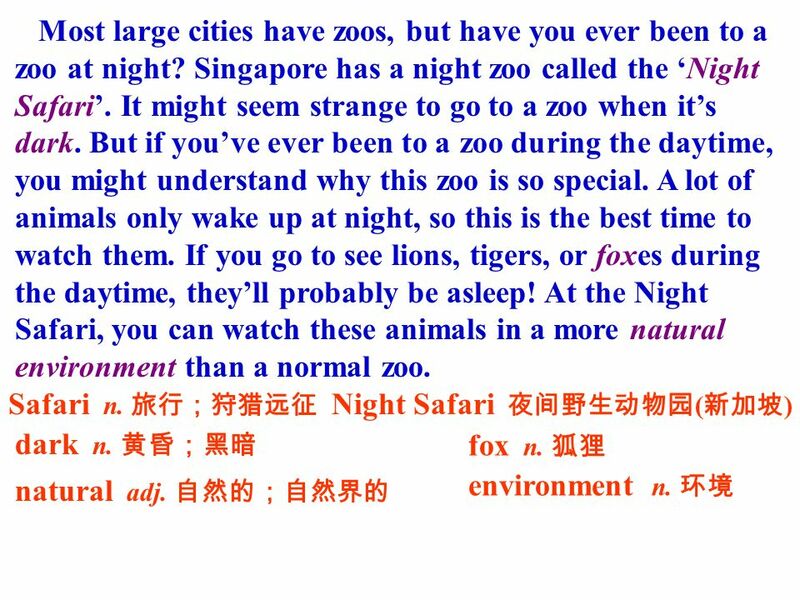 Singapore has a night zoo called the Night Safari. It might seem strange to go to a zoo when its dark. But if youve ever been to a zoo during the daytime, you might understand why this zoo is so special. A lot of animals only wake up at night, so this is the best time to watch them. If you go to see lions, tigers, or foxes during the daytime, theyll probably be asleep! At the Night Safari, you can watch these animals in a more natural environment than a normal zoo. Safari n. Night Safari ( ) dark n. fox n. natural adj. environment n.
7 One great thing about Singapore is that the temperature is almost the same all year round. This is because the island is so close to the equator. So you can choose to go whenever you likespring, summer, autumn, or winter! And, of course, its not too far from China! temperature n. all year round (= all year long ) all day long / round all night long / round equator n. whenever conj. 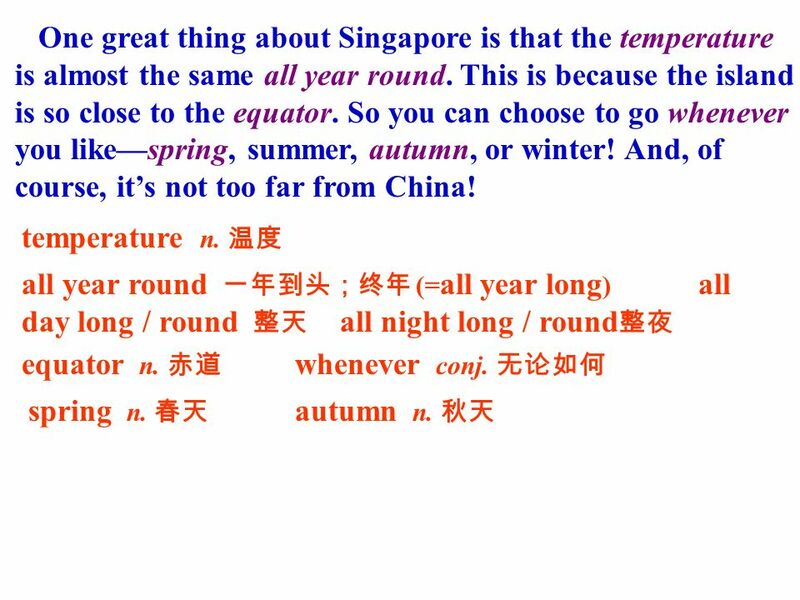 spring n. autumn n.
8 Questions: 1 Where is Singapore? 2 What language do people speak in Singapore? 3 Why can we speak Chinese in Singapore ? 4 Can we speak English there ? Why? 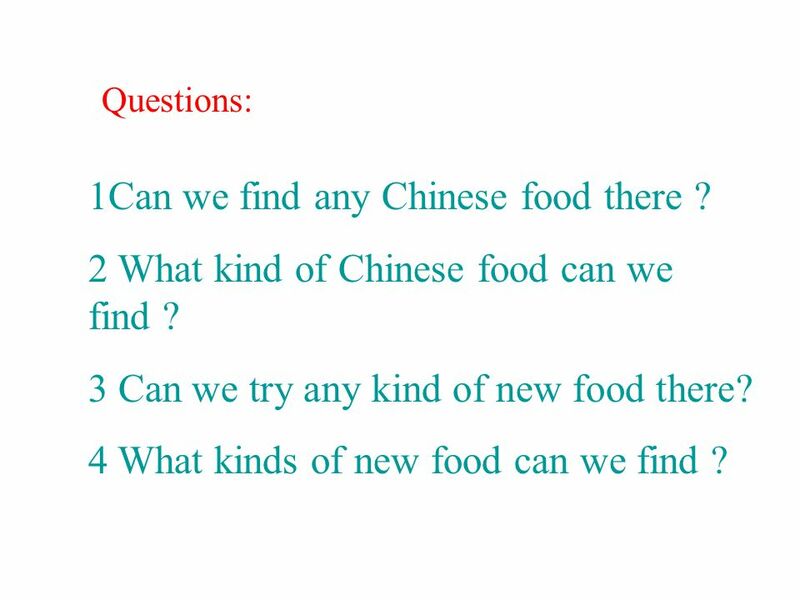 9 Questions: 1Can we find any Chinese food there ? 2 What kind of Chinese food can we find ? 3 Can we try any kind of new food there? 4 What kinds of new food can we find ? 10 Questions: 1Have you ever been to zoos? 2Have you ever been to a zoo at night? 3 Singapore has a special zoo.Whats its name? 4 Why is the zoo so special ? 5 Why is the Night Safari so good? 6 What is the weather like in Singapore ? Why? 7 When can we go to Singapore? 12 3c The statements are all false. Using information from the reading. 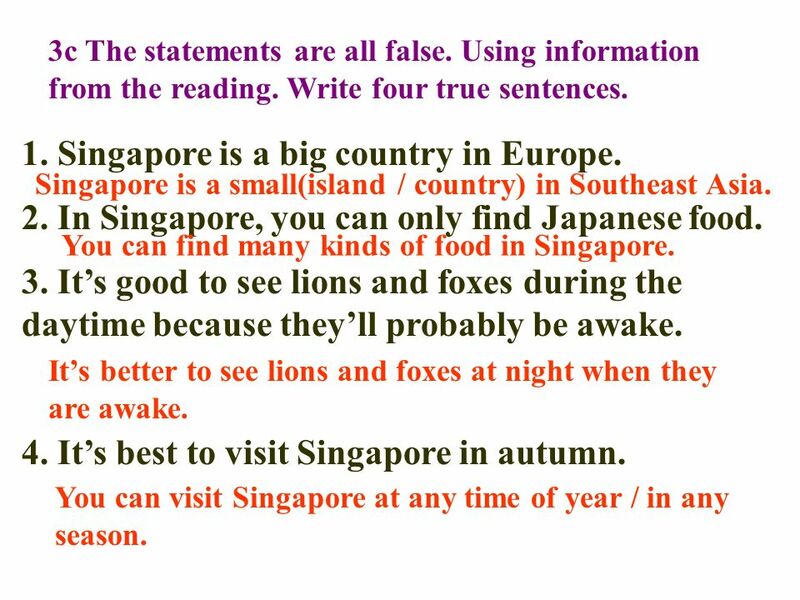 Write four true sentences. 1. Singapore is a big country in Europe. 2. In Singapore, you can only find Japanese food. 3. Its good to see lions and foxes during the daytime because theyll probably be awake. 4. Its best to visit Singapore in autumn. Singapore is a small(island / country) in Southeast Asia. 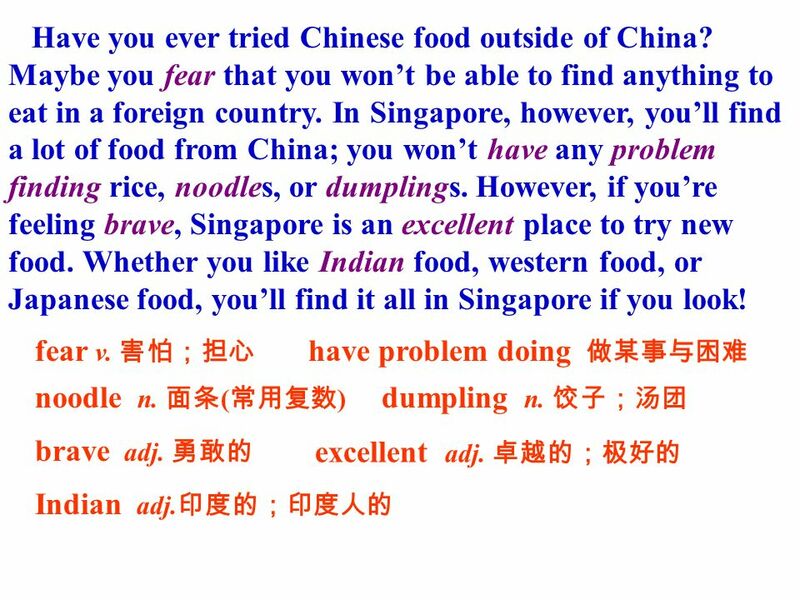 You can find many kinds of food in Singapore. Its better to see lions and foxes at night when they are awake. You can visit Singapore at any time of year / in any season. 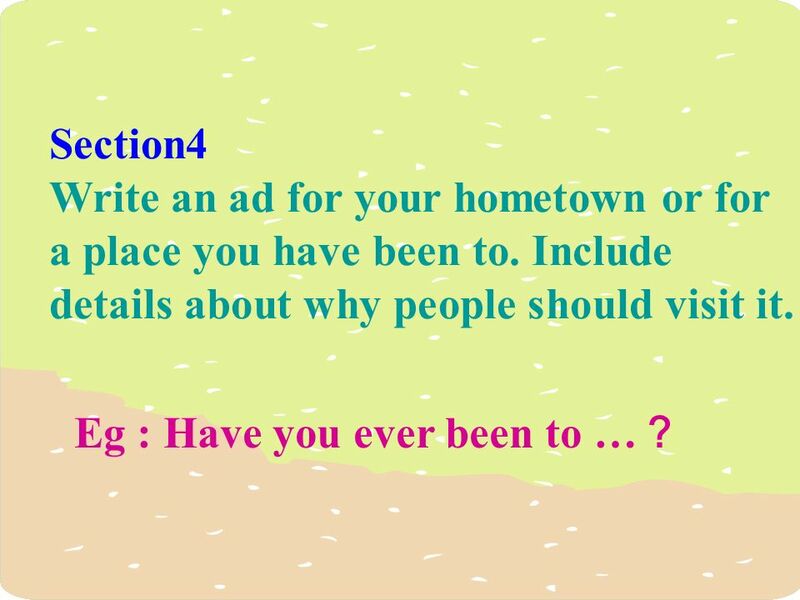 14 Discuss: If you have a chance to go to Singapore, what will you do? Download ppt "an amusement park? Read the first sentence of each paragraph. Guess: What does the writer talk about Singapore? Reading: Have you ever been to Singapore?" Unit 2 Say this passage in your dialect. 3 AE BE elevatorlift apartment candy eraser In a team truck fall subway On the play ground flat sweets rubber. Who is Hibernating? Created by Sally Musick. people plants and what about animals? A __________ is the place where living things live and grow together. HABITAT people plants animals B A A I T T.
You have been in the States for several months now. Do you like your life now? You have been in the States for several months now. Do you like your life. Spain. Location,map,and population of Spain Spain's boundaries Land boundaries: total: 1,917.8 km border countries: Andorra 63.7 km, France 623 km, Gibraltar. Spelling Lists. 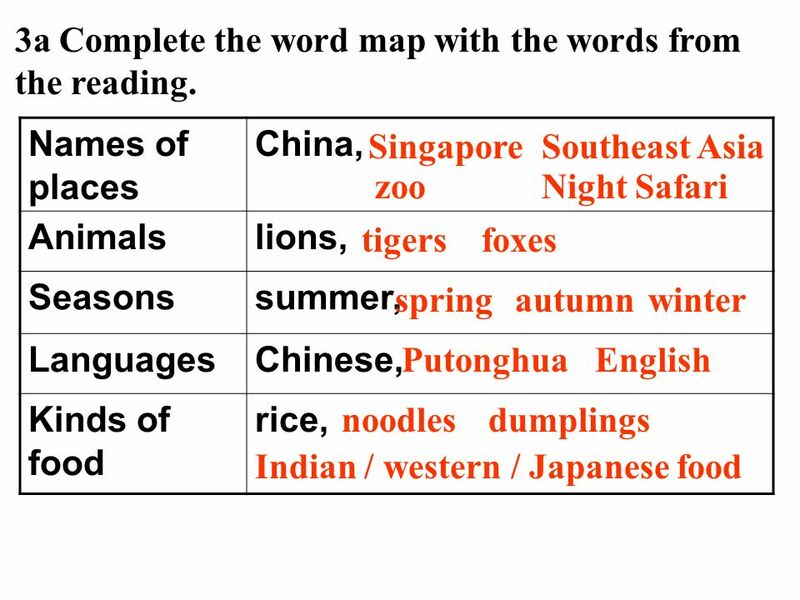 Unit 1 Spelling List write family there yet would draw become grow try really ago almost always course less than words study then learned. Come to the u.s.a! GET YOUR MIND ON u.s.a. Do you want the time of your life? Look no further the U.S.A is the place to go! The most famous city in the. Being All Ears Listen and Decode Listen and Respond Listen and Complete Listen and Judge Listen and Read Listen and Match Listen and Conclude. When is there rainbow in the sky? When can you see it? 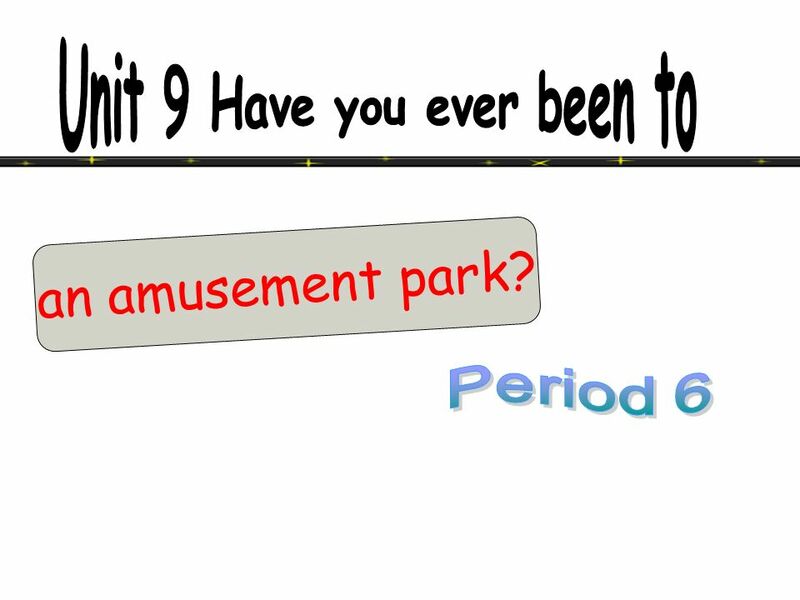 Unit 9 Have you ever been to an amusement park? Reading. Unit 9 Unit 9 Have you ever been to an amusement park? Reading. Unit 9 Have you ever been to an amusement park?. Reading.